Waverley Reach is a fabulous holiday home in Hamble with flexible accommodation (up to 10 people) making it ideal for families, sailing crews and large groups. Walking distance to the marina and a fantastic selection of public houses, restaurants, coffee shops, boutique / gift shops and a Co-Op. 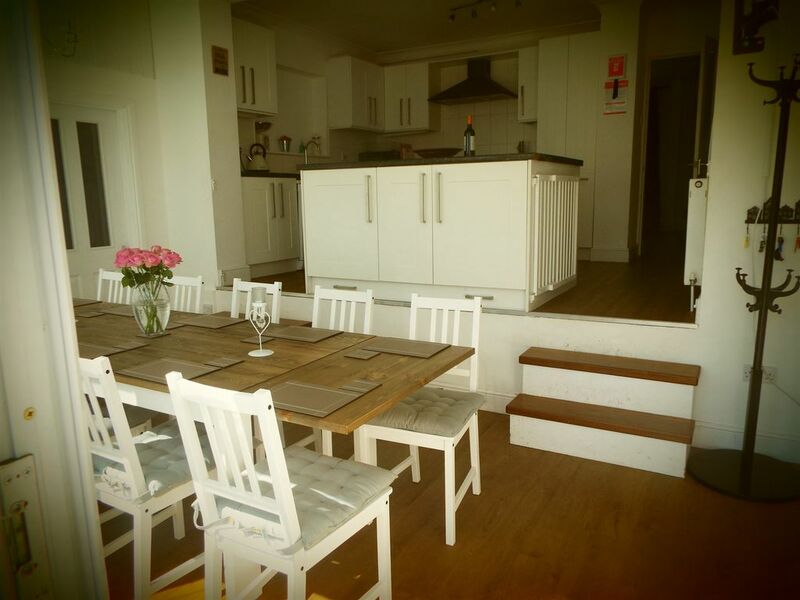 The large split level kitchen/diner is fully equipped perfect for cooking and socialising. The dining table seats 10 people. The living room has a log burner, perfect for chilly evenings. There is also a playroom. There are three bathrooms: one ensuite with loo, bath and separate shower, 1 family bathroom with loo, bath and shower over the bath, 1 bathroom (accessed via the playroom) with loo and shower cubicle. Bedroom 5 - (sleeps 2 people) - Bunk bed. There is also a sofa bed in the playroom. This is a double sofa so would really only sleep one adult, or two children. Our property has free of charge WIFI, televisions in Bedroom 1, living room and playroom, a washing machine and tumble dryer available to use (free of charge). If you are travelling with young children we can also provide a travelcot and a highchair. There are stairgates fitted to the two steps in the split level kitchen/diner. I can recommend two local private chefs. Please contact them directly if you wish to find out more information. toilet, shower, Accessed via the Playroom. There is a log burner in the sitting room. Space for 2 cars on the driveway. Parking on the street surrounding the property is free of charge, no permits required. Log Burner A small amount of logs & kindling will be there for your arrival. The local farm shop sells wood. American style F/F with fridge / freezer / ice maker. A small amount of Milk, tea and coffee will be provided on your arrival. There is a very well stocked co-op in the village. Dinner plates Bowls Serving Dishes Pots & Pans Utensils Cutlery fully equipped. Televisions in all bedrooms except the bunkbed room. Large tv in the sitting room with a separate DVD player and Netflix. Stereo available for guest use (located in dining room but easily moved). Play radio, cds or plug in your own music. Bookshelf in living room full of books. Selection of Board games in Living Room. A selection of toys in the playroom. Enclosed front garden. Also decked area to the rear of the property. Very comfortable in a nice area with good amenities nearby. We all very much enjoyed our stay. Wonderful house with great facilities and well equipped. The bedrooms were all lovely and comfortable and we loved the wood burner in the sitting room. The house is just a short walk from the village, and we found a lovely selection of pubs and shops. We would definitely recommend this property. Spacious, well equipped, clean and cosy accommodation in an amazing location. The accommodation was just as described and our party of nine felt at home as soon as we walked through the door. There was ample space throughout the accommodation, seats on the sofa and glasses, plates and cutlery etc. for the nine of us. Hamble is an amazing location and very easy for us to travel to the Christmas Market in Winchester which was the main reason for our stay. We would recommend this accommodation to our family and friends and definitely consider coming back one day. We had a wonderful family get together, house comfy and well kitted out, not precious so children and 2 labradors were at ease...as was I having planned the event!! One v minor issue, could find no food recycling bin?? ?...or a dustpan and brush!!!! Bedrooms all a decent size and beds comfortable, kitchen fairly well equipped. Property is in good condition but could probably do with freshening up or tidying up in places. A guest 'folder' with instructions and local information (what to do, where to go, where to eat out, kind of thing) would be a useful additon. Location ideal for marina, waterfront and walks along the marshes, would certainly consider booking again.